A Lawrence firefighter walked past a row of travel trailers Saturday. 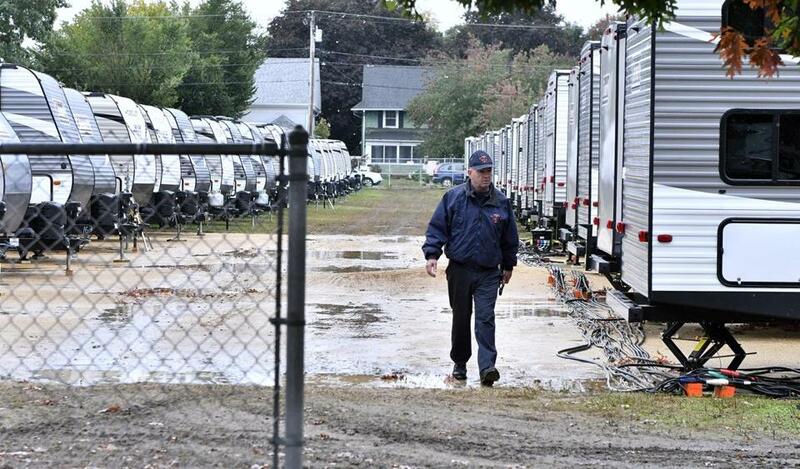 LAWRENCE — Row after row of travel trailers were lined up Saturday on the mud and grass of public parks across three Merrimack Valley communities shaken last month by natural gas fires and explosions. Many remained empty, but with temperatures dipping into the 40s and thousands of local structures awaiting the restoration of heat and hot water, demand for these miniature homes on wheels is rising, according to an official. “We’ve had 57 new housing requests today, up from 30 yesterday,” Scott Ferson, a spokesman for Columbia Gas of Massachusetts, said by phone about 4:30 p.m. Saturday. The utility, which supplies natural gas to Lawrence, Andover, and North Andover, was faulted Thursday by federal investigators for failing to relocate a pressure sensor from an unused pipe during construction work last month, triggering a flood of gas that sparked the fires and blasts. Columbia has made about 400 trailers available to affected gas customers, Ferson said, and by Saturday afternoon there were 58 assigned. While repairs continue, the Massachusetts Emergency Management Agency is working with Columbia to ensure that no gas customer affected by the disaster will go without a warm place to sleep, according to Christopher Besse, a MEMA spokesman. Housing options include hotel rooms, apartments, and a shelter in the former Malden Mills building on Stafford Street in Lawrence that has cots for up to 250 people but can expand to serve about 1,000 if necessary. On Saturday, there were 4,600 hotel rooms set aside for Columbia customers, with just over 1,600 of them occupied, Ferson said. Columbia had secured 166 apartments and was in the process of assigning them, he said. A cruise ship brought in to provide housing for out-of-state workers arrived on Friday and docked in the South Boston Seaport, Ferson said. That ship has 1,900 rooms and can house 3,000 or more workers, he said. “They’ll be there just to sleep. Everyone’s working six days a week,” Ferson said. Repairs were ongoing Saturday, with 205 crews working across the three affected communities, Ferson said. Already, 26 miles of gas pipe have been replaced ahead of a self-imposed Nov. 19 deadline, Ferson said, and more than 1,950 gas lines running from the street into homes and businesses have been replaced. Columbia Gas customers in Lawrence, Andover, and North Andover who need temporary shelter should contact the company’s claims line at 1-800-590-5571.